Good day everybody. Welcome, and thanks for coming by today. 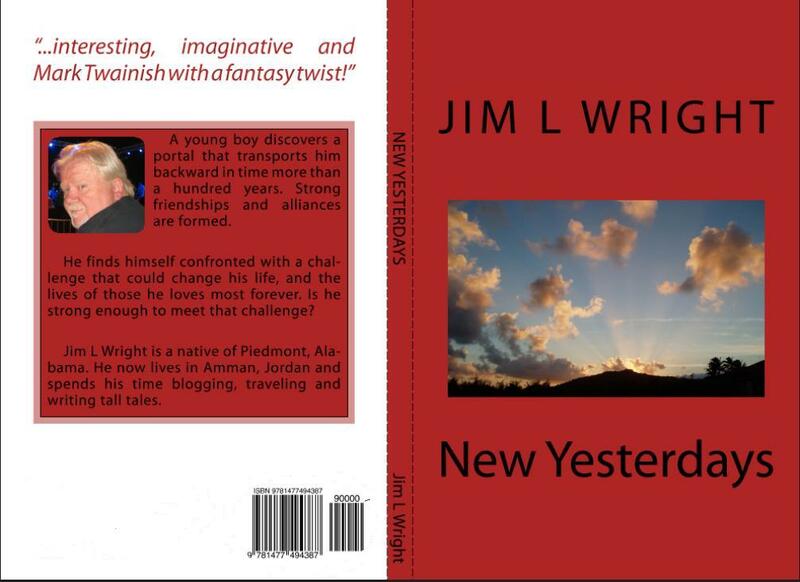 In this episode, I’m interviewing my alter-ego, Jim L Wright, author of New Yesterdays. Because I’m his ‘other (dark?) half’ so to speak, I reckon I could tell you a juicy thing or two about Jim, but then I might tell something he’d rather keep close to the vest for now. We’ll wait until he is famous and leak the tantalizing tidbits to the tabloid media. So, I’ll just get right in to it and begin with a few questions. I’m Jim L Wright, and I write. <brief pause for audience titter> I’m an American expat living in Amman, Jordan. Oh, and did I mention I write? Is your writing space neat or messy? My corner of the office is neat as a pin… once or twice a week. The rest of the time it’s covered with dust and cigarette ashes, littered with coffee cups and water bottles and strewn with random bits of paper with notes and ideas hastily scribbled on them. What are your current and past projects? I’ve just published my first book, “New Yesterdays“. Now, I’m working on two new stories. The first one is called “Canaan Dogs“, a story about international intrigue and biological warfare. The other one is tentatively entitled “The Wall Crack’d“. It’s still a little bit unclear just where that story is going. The main character is keeping everything pretty mum at the moment. It’ll definitely be a fantasy, but I suspect there may be some horror elements in it, as well. I post excerpts at my “Canaan Dogs” blog page and “The Wall Crack’d” is being serialized on my Left Wright Brain blog page. I’ll give the links to both of them at the end of this interview. Does humor play a part in your writing? Not intentionally, no. What I mean, is I don’t deliberately set out to write humor. Many times though, my turn of phrase and frequent use of old sayings is perceived as humor. If it makes the reader smile and doesn’t detract from the story, I’m happy. Best advice about writing you ever received? Two bits of advice, actually. The first bit was “just write!” Sometimes, if I’m having a bad day, I’ll write a bit of flash fiction or free writing in an effort to get the juices flowing again. It usually works. The other bit of advice was something I read in an interview. For the life of me I can’t remember who the author was. But what he said stuck with me. He said that when you are up against a wall and just can’t think of a damned thing to write, just kill someone off! I recently slammed into that wall with “Canaan Dogs”. I grunted and groaned and wallowed around on the floor trying to come up with something (thank you Joann Wallace!). Nothing worked. I remembered that advice and suddenly my main character was the target of an assassination attempt! God bless him, he survived, but it got the attention of the Muse and I was off and typing again! Who, among your family and friends is your biggest supporter? My biggest supporter is my Companion, Zeek. When I need a cheerleader, he is there. When I need someone to be ‘rough and gruff’, he’s there for that, too. He’s the first to praise me, but he’s also the first one to tell me to quit weeping, wailing and gnashing my teeth and put my big boy britches on and get busy! That’s pretty important, I reckon, when my fragile ego is taking yet another beating. He also makes a heavenly cup of coffee! My cousin, Marsha Gail is always there too, with a generous helping of encouragement. Like Zeek, she believed in me and my stories right from the beginning. They both push me and support me when I’m ready to throw in the towel. What is your reaction to the self-publishing process? All in all, I reckon I’m pretty happy with it. It presents opportunities that many of us mightn’t have had otherwise. The biggest problem with it though, is publicity. I’m a stone eejit when it comes to advertising and I’m too damned shy to push myself adequately. I keep falling back on my raising, when I was told it was a ‘bad thing to toot your own horn’. I’m trying to get past that, but it’s a big battle. Without a doubt, my absolute favorite author is Mark Twain. There are others of course, many others, but no one measures up to the story telling abilities of Twain. The best thing for relaxation, for me, is self-hypnosis. Unfortunately, I don’t do it often enough. Most times, if we can manage it, I like to get out of the house and see things. Even though I’m not consciously thinking about my projects, ideas seem to fall into place and take form while I’m wandering around ancient ruins like Jerash or the Desert Castles, taking a dip in the Red Sea, or ‘winder shopping’ in downtown Amman. What helps you write? Do you eat and drink while writing? Music? Housework? Any strange rituals or odd habits? No rituals or odd habits… or at least they don’t seem odd to me. But, I can’t even open a document to begin writing without a fresh bottle of cold water and a cup of coffee. The water bottle has to be on the right, on a cloth coaster and the coffee has to be on the left, also on a cloth coaster. Before I start writing, I dust the keyboard. If I feel dust under my fingertips it sets my teeth on edge! Long ago I tried listening to music as I write, but found it to be too distracting. I never eat when I’m writing, though. I can’t abide crumbs and grease on the desk and keyboard if I’m trying to write. My mind seems to focus on that, rather than my writing. What about writer’s block? How do you deal with it? I think we touched on that a little earlier. If I absolutely can’t get started, I’ll kill someone. Usually though, if I run out of steam say on ‘Canaan Dogs’, I’ll close it and open ‘The Wall Crack’d’ or do some free writing or flash fiction. If that doesn’t help, I’ll do some household chores or just get out of the house and wander around. What advice do you offer to aspiring writers? I’d offer the same advice I got. Just sit down and do it. Don’t worry about grammar, spelling, syntax or any of that crap. Don’t worry if the story doesn’t flow as it should. All those things can be dealt with in the editing process. The most important thing to do is get the story down. I learned that while participating in NaNoWriMo twice. The goal for NaNoWriMo is to write a 50,000 word novel in thirty days. When you have to produce that kind of work in such a short time, there’s no time for editing or niceties. Just tell the damned story! The print version of my book can be found at Create Space, a POD publisher that I highly recommend because of the positive experience I’ve had with them. The e-book can be found at Smash Words and soon I’ll have the revised edition uploaded to Amazon. I keep a blog at WordPress called ‘The Left Wright Brain‘. The other blog pages, ‘Canaan Dogs‘ and ‘Ol’ Big Jim‘ can be found on the sidebar. You can also find me on Twitter, Facebook, and Good Reads. This entry was posted in Random Musings and tagged Flash fiction, Mark Twain, WordPress, writing. Bookmark the permalink. Thank you so much for those words, Mother! Coming from you it means a lot! Great post, Jim. It’s nice to learn a little more about you. I love your advice to aspiring writers and couldn’t agree more. Thanks so much for your visit! I really do think that’s the best advice I ever received. It’s hard not to edit while writing, but it’s so very freeing, too! I really enjoyed this Jim! I took a lot away from it. I have one thing to say as far as the advertising goes. Pull up your big boy britches and toot that horn buddy! You have something to toot about! Ah, Jase! What would I do without you? Polishing up the horn and getting ready to toot! Your Bio-warfare book sounds interesting, let me know if you need help. I would be more than glad to give it. Thanks for visiting, Ahamin! Nice to have a fellow author “in the neighborhood”. I’m sure making a note that you might be a consultant for Canaan Dogs! Thanks for the offer! Aha, so sorry for that!